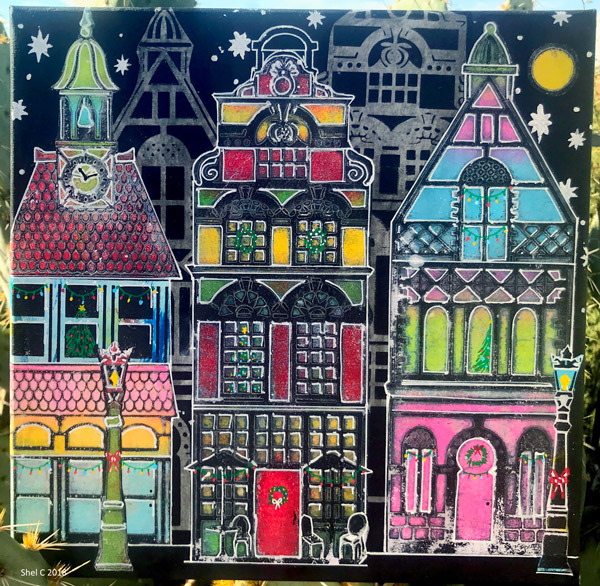 StencilGirl Talk: Check out the houses in our town ~ StencilClub Voices built it! Check out the houses in our town ~ StencilClub Voices built it! Greetings Stencil Lover! Carol Baxter here. I have had these stencils in my possession for a while and they have been crying "build a town"! Guess what! 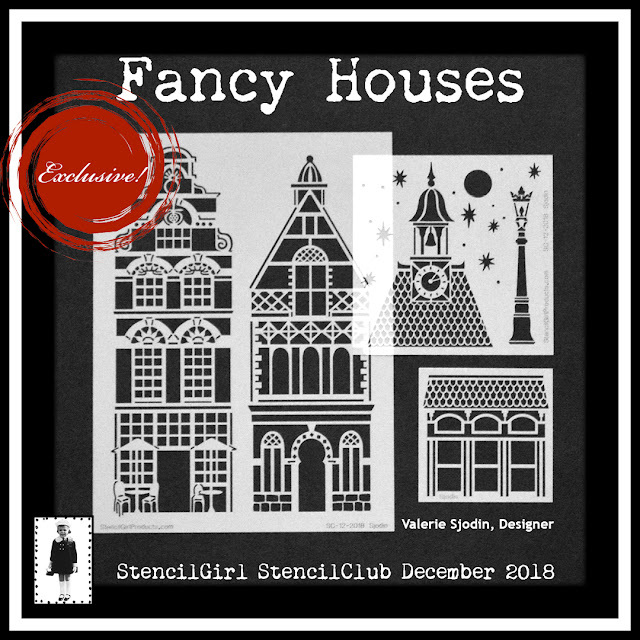 Our fabulous StencilClub Voices, Shel C, Jill Holmes, and yours truly, built neighborhoods with Fancy Houses, the StencilClub set for December, designed by Valerie Sjodin. Take a tour through StencilGirl Town! 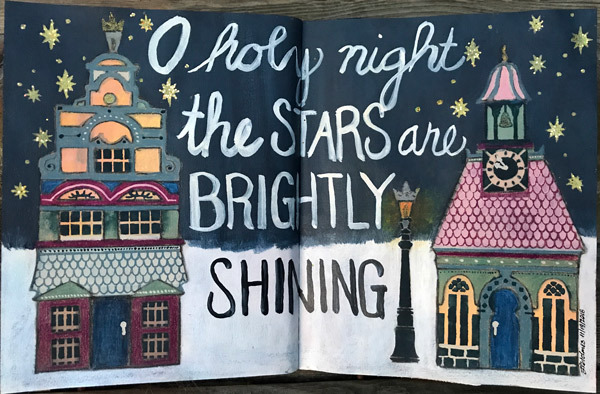 "I had a lot of fun playing with Valerie’s December StencilClub set. The architectural designs are the same sizes such as to be interchangeable. I combined different sections of the different stencils to create my small village scene. The largest stencil features almost 12-inch building designs and my Strathmore Multimedia journal measures only 10 inches tall. It was a lot of fun creating smaller, yet seamless designs with all of the building elements." You can see Jill's process on her blog. Valerie's Fancy Houses called to me and said, summer, fall, winter, spring. Spring gave me flowers which led me to think of flower children so maybe this is The Haight. The other stencil you see is Jessica Sporn's Feeling Groovy set from April 2015. There are so many tree stencils that would set off these Fancy Houses too! I am looking forward to enlarging my town. 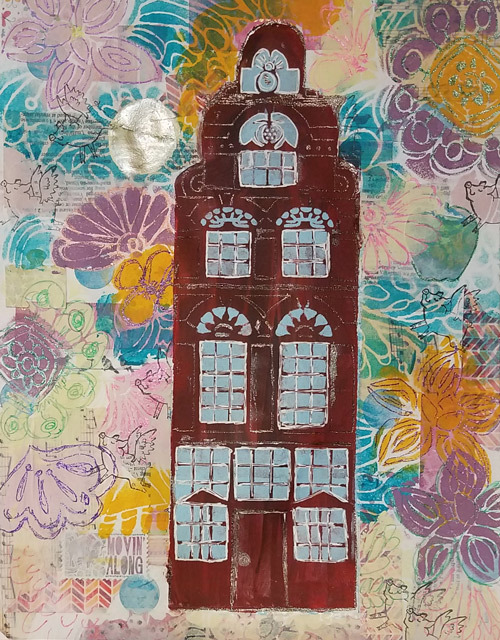 There are many possibilities for interchanging roofs and dormers, etc, and making these stencils at home in your art journal or larger art projects but you need to be a member of StencilClub. Not only does membership come with the stencils, but there is a special project by the designer that you can download in video and pdf form, a coupon, and you can be a part of our art community. If you would like to watch Valerie reveal the inspiration behind her Fancy Houses, click here.